While the views at our boondock site in Grand Teton were, well, grand, the warming weather brought out ridiculously large mosquitoes in droves so we were not sorry to pack up and head north to Yellowstone. Since Yellowstone is just north of Grand Teton, we didn’t expect our drive to take very long but we blew that call. First, the line to get into the south entrance of Yellowstone was insane and took about 30 minutes of waiting, even though we were arriving “pre-season”. Next we had to tackle windy (twisty) and windy (lots of wind) [english is weird] one-lane roads which meant multiple stops at the many side pullouts so we could let traffic pass us. Yellowstone is the first national park in the US signed into law by President Grant in 1872 and some say the first national park in the world. 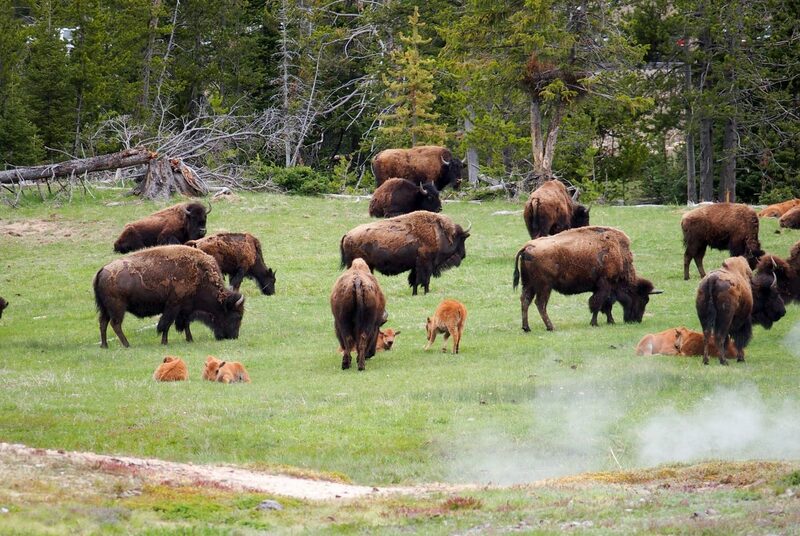 Even though Yellowstone was declared a national park, originally there was no funding or support to protect the wildlife, improve the land, or even install formal policies and regulations. That meant poachers and vandals raided Yellowstone with impunity until the US Army finally came into the region in 1886. They spent the next 22 years building permanent structures, improving roads, setting regulations, and protecting wildlife and natural resources. 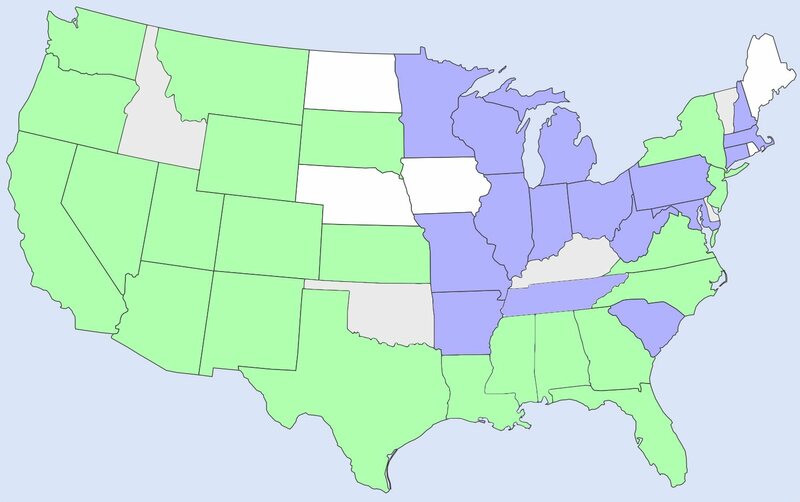 Due to the success of the army, the National Park Service was created in 1916 to continue protecting national parks and the army turned over control in 1918 to NPS. 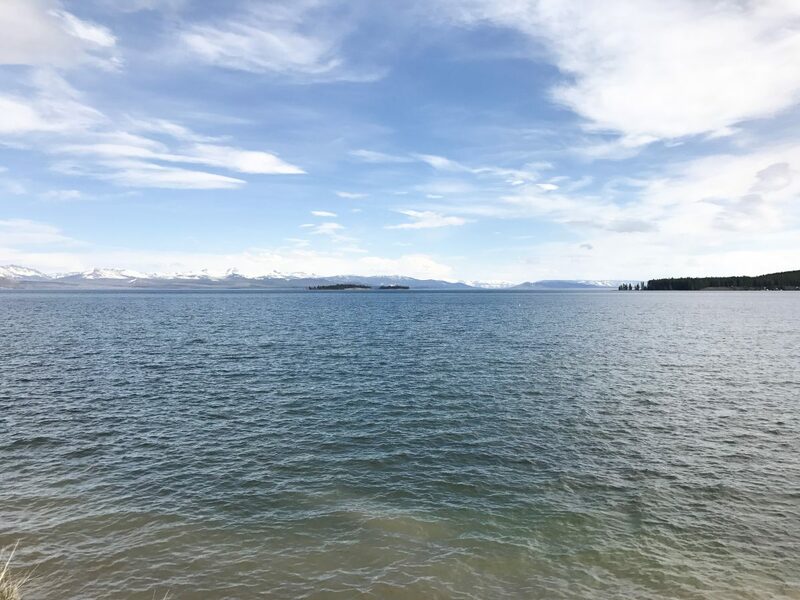 Driving past the gigantic Yellowstone Lake. 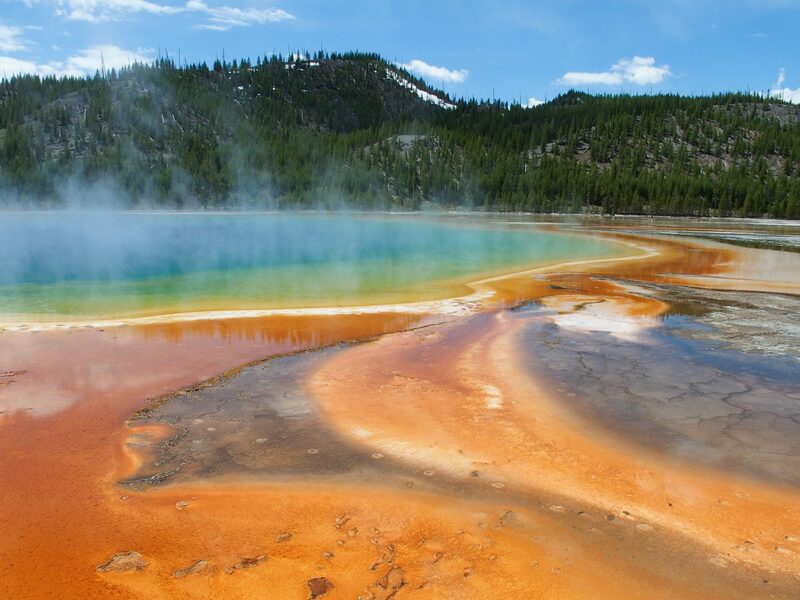 Yellowstone NP encompasses almost 3,500 square miles including the Yellowstone Caldera (a giant sunken crater caused by volcanic activity) and is the current location of a magma hotspot which powers all the geothermal features that make Yellowstone so famous. 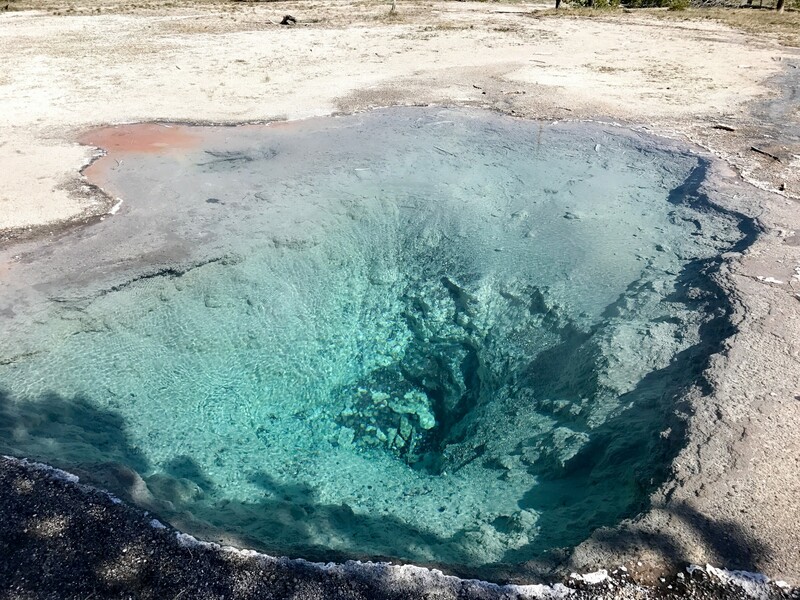 Since we (the North American plate) constantly move southwest at a blinding speed of 4.6 cm/year, (imagine a raft floating on top of water, that’s what we do on top of magma) the hotspot will be located in Montana in about 10 million years and Old Faithful won’t work anymore. But for now, the Yellowstone Caldera is the location of the supervolcano (named because the caldera was formed by a cataclysmic eruption). Yellowstone erupted 640,000 years ago producing a caldera 45×38 miles wide and 5/8 mile deep. The eruption was over 1,000 times the size of Mount St. Helen’s eruption in 1980. So yeah, when we visit Yellowstone, we’re still walking all over an active volcano. The good news is that most scientists don’t think the supervolcano is due to explode anytime soon! 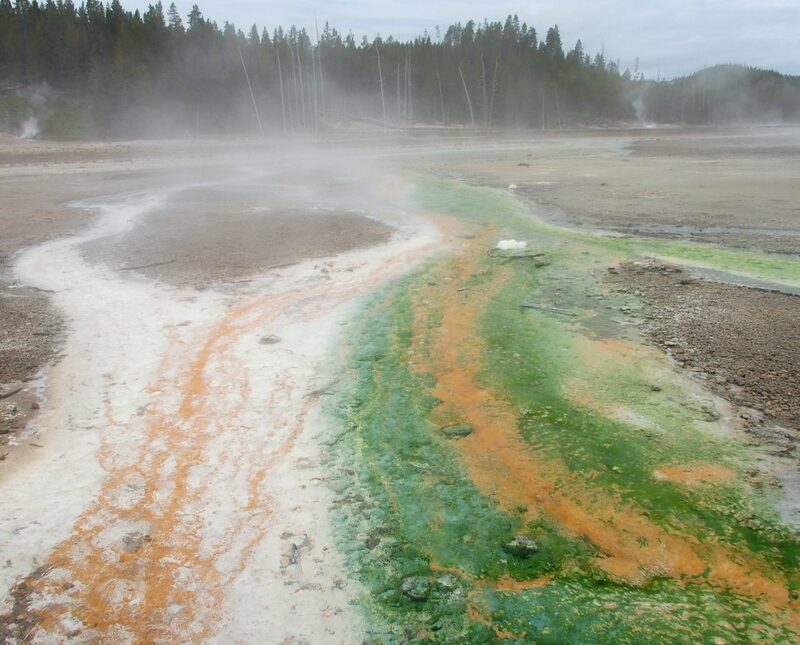 Hot streams full of various chemicals cause colorful bacteria “matts” to grow. Yellowstone still had a fair bit of snow on the ground and Lewis Lake was still completely frozen since we were slightly ahead of the season. Grant Village Visitor Center was still closed and many of the hikes were closed due to bear activity. We did see plenty of bison during our drive and even a coyote making his way through the bison in a field (I don’t think the bison felt threatened). After a fair bit of driving, we made it to West Yellowstone and the Grizzly RV park located there. We were pleasantly surprised at the amount of space in each site, plus the park butted right next to the National Forest (with trails) which meant Opie had lots of places to walk since Yellowstone NP is not dog friendly. 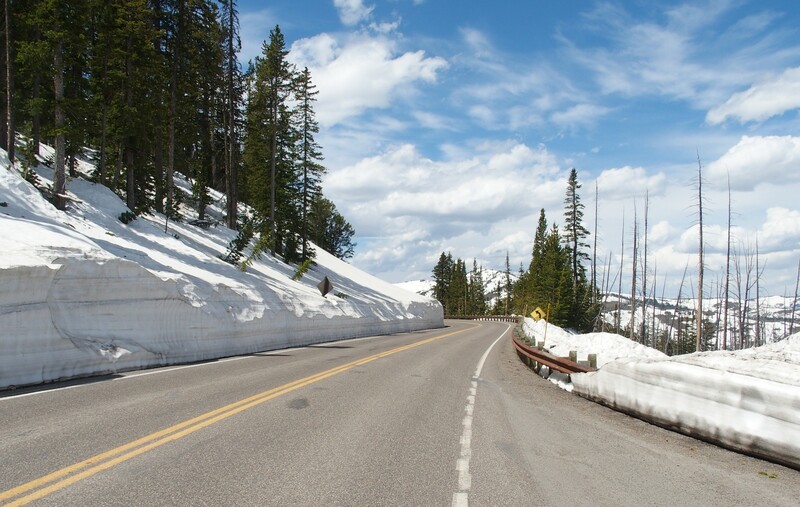 Plenty of snow left on June 1. Yellowstone is HUGE! It really does take 45 minutes to an hour to get to anything in the park so it’s a good thing we were there for 10 days. Even though we beat peak season, the park was still extremely crowded, making traffic and parking a challenge. The bison jams did not help the situation either. 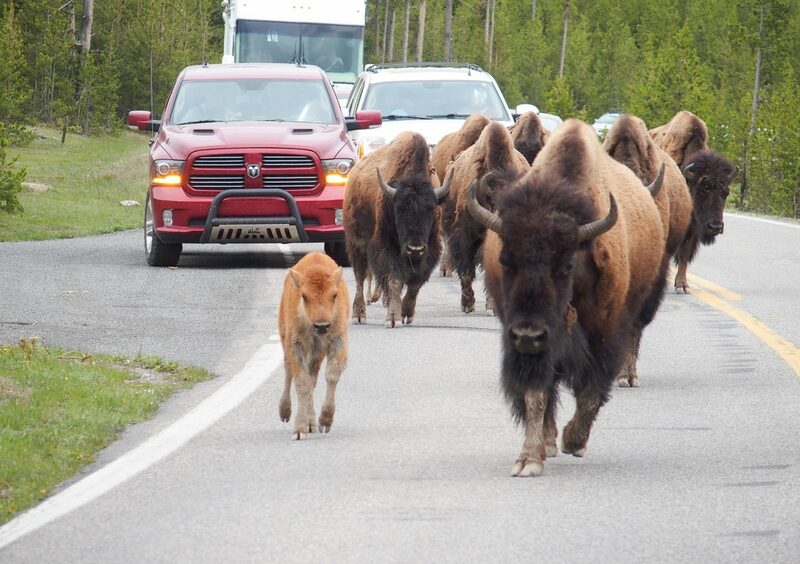 Every single person who has visited Yellowstone told us the same thing. The first day you see bison far off in the distance and get really excited. You pull over, take lots of pictures and oh-ah. Then you see them next to the road and take lots of pictures. 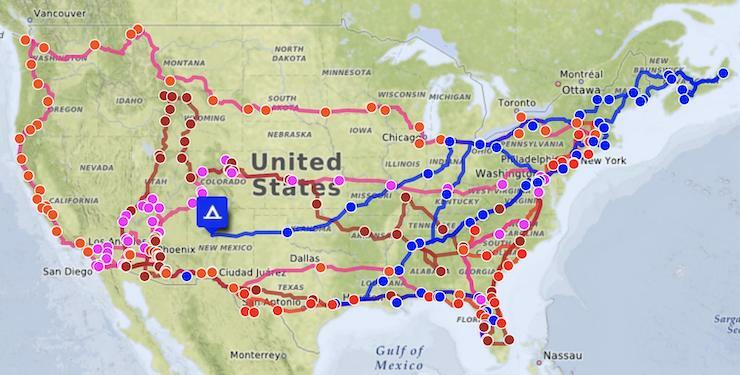 By day 3, you wish they would just get out of the way and let you drive to your destination! That was exactly our experience too and by the end of the week, we didn’t bother stopping for pictures even if the bison was right by the road. We hit the popular side of “have to sees” of Yellowstone for our first couple of days, crowds and all. Grand Prismatic Springs (photo, top of page) is the largest hot springs in Yellowstone and is known for its striking colors. In the past, people could hike Fairy Falls and see a great view of the springs at an unofficial overlook but due to erosion, the trail is currently closed for construction this year. It’s still amazing to see at ground level but it’s best to visit the spring later in the day when it’s warmer. The cool mornings makes for a lot of steam, making it difficult to see all the colors. Biscuit Basin, Black Sand Basin, and Fountain Paint Pot are also great stops to make along the way. 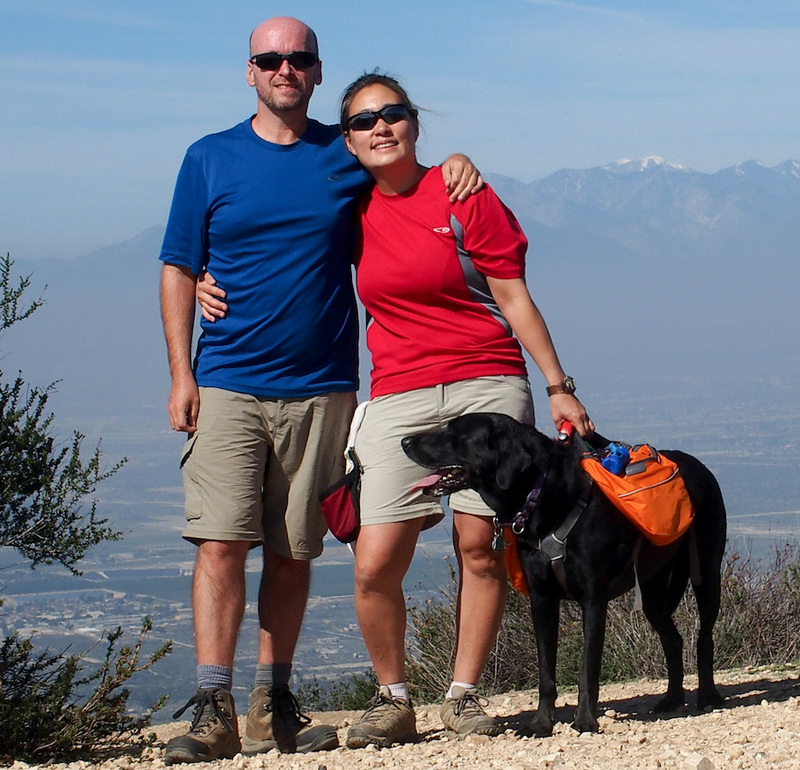 Each has a short 0.5-1 mile walkway to see the various geysers, paint pots, and springs. Firehole Canyon drive is a short 2 mile one-way drive through the canyon with rushing waterfalls and a swim area (currently closed due to bear activity). Look inviting for a quick dip? Not in this boiling acidic water! 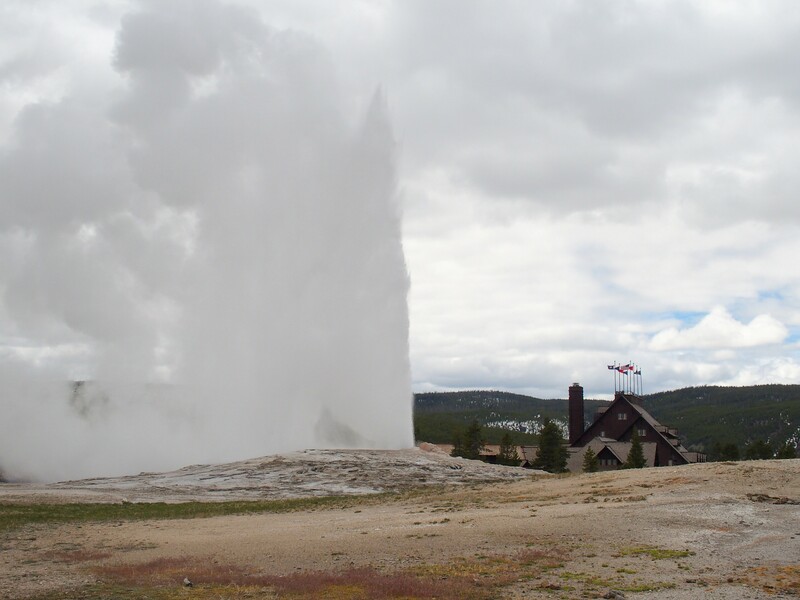 And of course there’s Old Faithful, the most well-known geyser in the US. Old Faithful isn’t faithful because it erupts every “x” minutes, but because naturalists can predict the next eruption of Old Faithful based on the duration of the previous eruption. Intervals range between 60-110 minutes and can be predicted usually within +/- 10 minutes. The viewing area for the geyser is enormous with benches. Since the wind was blowing the steam towards the benches, we walked to the “back” of the geyser for smaller crowds and a better view of the eruption. It is an impressive site to see all that water and steam shooting over 100 feet into the air. 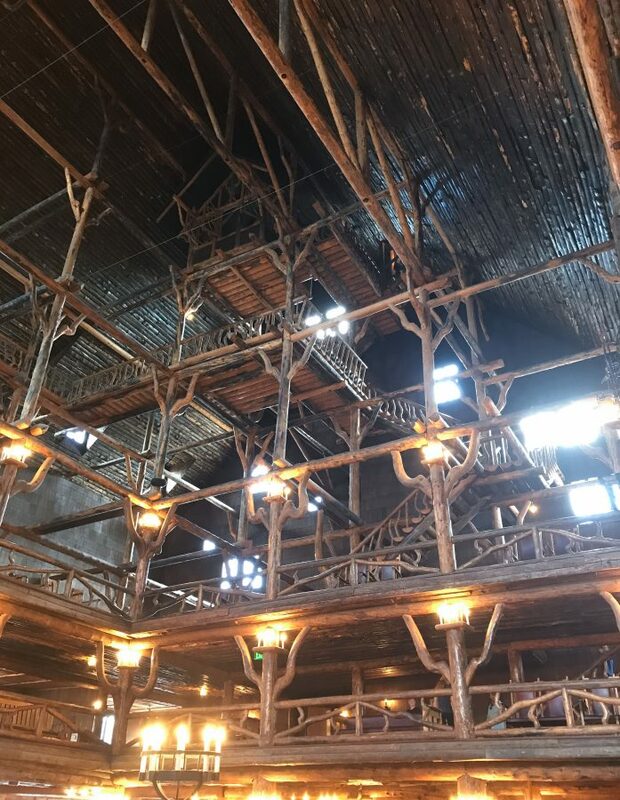 While at Old Faithful, we took a walk through the Old Faithful Inn, a log hotel built in 1904. The interior boasts a huge log structure with four floors of balconies and a huge stone fireplace. The architecture is mind blowing and it’s hard to imagine the amount of work involved in building the inn. Old Faithful Inn. Photos can’t convey the grandness! With so many things to see and do on the west side of Yellowstone, it took us a few days to see all the main sites. The hiking trails were beginning to open to the public but I made the executive decision not to do any hiking in Yellowstone. Seriously there are signs/warnings EVERYWHERE about bear activity. All the signs say to bring bear spray (which we had none), hike in at least groups of 3, and to make a lot of noise. Most of the time, I pooh-pooh the warnings as over the top but these signs were everywhere and I don’t want to get eaten so we kept off the trails this time. 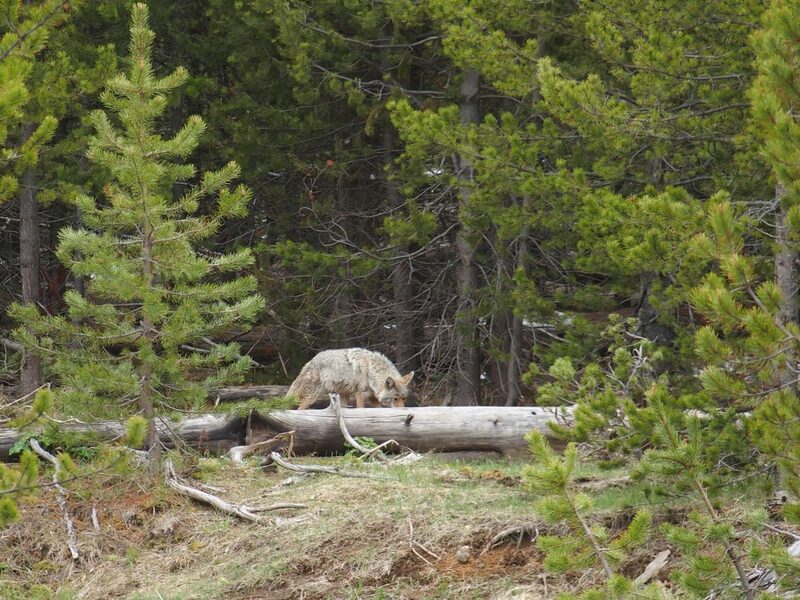 More on the rest of Yellowstone in Part 2…. “[english is weird]” – largest understatement I’ve seen in a while. So neat! There was an earthquake a few days ago in Western Montana. I wonder if it is related to the yellowstone system? Also, OMG bison calves! (Sorry, I haven’t been there for 3 days).